Charles Dickens relished the thrill of live performance, be it music, drama or dance. The Academy’s new exhibition Dickens and Music delves into Dickens’s connections to the Victorian musical world, from opera to street ballads. The novelist’s social and geographical connections to the Academy itself are also explored. Dickens’s ties to the Royal Academy of Music and its Marylebone setting lie at the heart of the display, illustrated by items from the Academy’s renowned collections. His sister Fanny was a student of the early Academy on two occasions, drawing both siblings into the society of young, gifted musicians. The Academy’s exhibition presents a unique opportunity to read an original unpublished letter penned by Charles Dickens and to see Fanny’s youthful attempts at musical composition. Dickens was even inspired to write an opera libretto, ‘The Village Coquettes’, to music composed by one of Fanny’s fellow students at the Academy, John Hullah. Perhaps wisely, Dickens stuck to prose after this! One of his Christmas stories formed the basis of Sir Alexander Mackenzie’s opera ‘The Cricket on the Hearth’, the manuscript excerpts of which are on display in the exhibition. Musical re-imaginings of Dickens’s great works of fiction also feature prominently. From their first publication to the present day, the exhibition will show how his stories are endlessly transposed into popular song, opera, drama and even modern-day West End musicals. John Orlando Parry’s famous painting ‘A London Street Scene’ will also form part of the exhibition, allowing people to discover hidden references to Dickens amongst the jigsaw-puzzle of 1830s posters. In his early 30s Dickens regularly stepped over the threshold of the Regency-era Nash building that houses the Academy’s museum now, to visit his great friend Charles Macready at home. 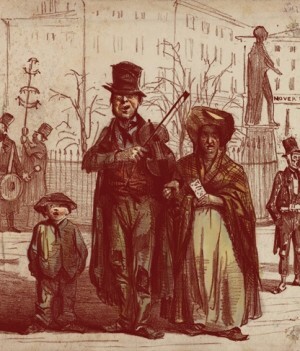 This link provides a suitably hallowed space into which Dickens and Music unfolds. This temporary display runs from 2 May to 20 December 2012, accompanied by a lively programme of events. Visit the Academy museum to see and hear a Dickensian soundtrack brought to life.